My heart skips a beat when wild salmon is on sale; I have to buy a hunk. This recipe makes good use of garden herbs and a profusion of nasturtium blossoms, which is an edible flower with a lovely, peppery flavor. One of the best tips I’ve ever received was many years ago from a clerk at the Produce Station. I was buying a nasturtium starter plant, and she said they are the easiest thing in the world to grow from seeds. She said she always grew a pot of them next to her grill, for impromptu easy garnishing. Being of a somewhat excessive-compulsive disposition, I’ve taken her tip to extreme. Each year I buy 15 or so packages of various nasturtium seeds, and the kids and I plant them around my yard. 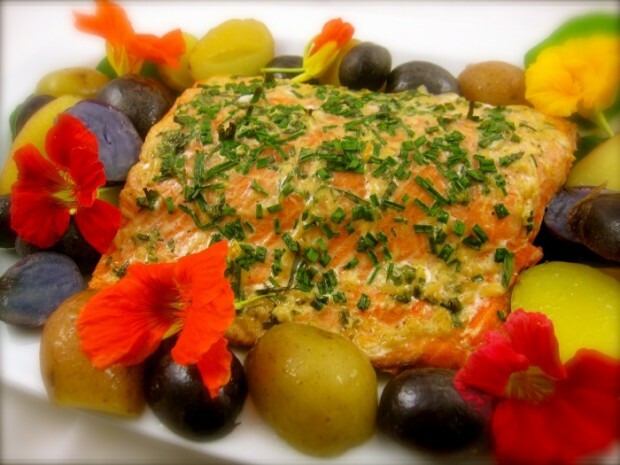 I have blossoms throughout the summer; now they are everywhere, including this salmon dish, which I served with assorted baby potatoes. 2 tablespoons snipped fresh chives. Spread flesh side of salmon with mustard; drizzle with walnut oil. Evenly sprinkle tarragon and chives over salmon. On a clean and oiled grill grate, prepare gas or charcoal grill to medium heat. Grill salmon, skin side down, with grill covered, 10-25 minutes depending on heat of flame, thickness of salmon and desired level of doneness.